This salad is so easy to throw together and would make a great addition to any weekday packed lunch. 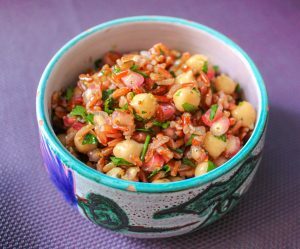 Combine cooked rice, chickpeas, pomegranate seeds and chopped herbs. Place all molasses dressing ingredients in an empty jar, shake well the pour over the salad ingredients. Combine well then serve.